The Office Coach, an Exempt Micro-Enterprise, has been audited by BEE BIZ Compliance (Pty) Ltd and rated a Level 4 contributor (to October 2016). 100% of any procurement spend with us would be recognised in the compilation of your own BEE scorecard. 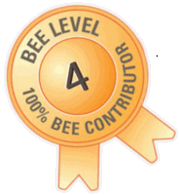 To view and authenticate this status, please click to view our current BEE Certificate.